When I first heard that photographic film company Fujifilm was launching a skincare range called Astalift in the UK, I thought it was a gimmick. I assumed that, following the demise of film photography, Fujifilm had decided instead to try and make a quick buck out of the beauty industry by creating a range that made skin supposedly look ‘photo-perfect’ (I’ve obviously been in the marketing game for too long!). You can’t blame a girl for being so cynical; the beauty industry is often taken advantage of for its high profit margins and speed of consumer replenishment. But actually Astalift goes a lot deeper than that and looks to be a serious contender on the UK anti-ageing skincare market. And here’s the really interesting thing: some of the most advanced ingredients in skincare are actually used within the photographic film industry too, and so Fujifilm has a vast background in the research and development of these areas. For instance, collagen – a skincare ingredient and a vital component of the skin that keeps it looking plumped and youthful, is also a key element of photographic film. Who knew?! What’s more, antioxidants, a regular on the skincare ingredient circuit to fight free radicals which cause the skin to deteriorate, are also used to prevent photographic film from fading. Finally, nanotechnology, a very targeted method of ingredient delivery deep into the skin (based upon ultra-fine particles), was also used by Fujifilm for film and data storage innovation. All these ingredients and technology can be found in Astalift and, going a step further, Fujifilm is also utilising a little-known super-ingredient called Astaxanthin, a natural antioxidant that is said to be 1,000 times more powerful than the popular Co-enzyme Q10 ingredient favoured by beauty giants such as Nivea. 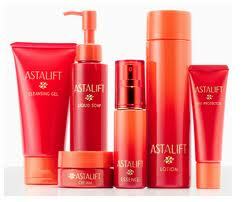 All of this makes for a superior skincare range and, having already experienced great success in the Asian beauty markets, I expect Astalift will not only make waves in the UK beauty market but will also bring the use of Astaxanthin to the fore.